news The Opposition has accused Malcolm Turnbull of telling a “lie” with respect to the cost of upgrading Telstra’s copper network to support Fibre to the Node technology on the National Broadband Network, at the time when the Prime Minister was the Shadow Communications Minister. Under Labor’s previous near-universal Fibre to the Premises model for the NBN, the HFC cable and copper networks owned by Telstra and Optus would have been shut down. However, the Coalition’s Multi-Technology Mix plan instituted by Malcolm Turnbull as Communications Minister in the Abbott administration is seeing them acquired and upgraded by the NBN company. However, internal documents released by the Opposition last week showed that, by the NBN company’s own estimates, the cost of remediating Telstra’s network had blown out by a factor of ten from original expectations, to about $641 million, with the cost of rolling out infrastructure to each premise via Fibre to the Node having blown out from $600 to about $1600 per premise. Speaking late last week at Parliament House, Clare said Turnbull had estimated that the cost of upgrading Telstra’s copper network to support Fibre to the Node technology would cost about $50 million, appearing to refer to costs estimated as part of the NBN Strategic Review conducted in November 2013 when Turnbull was Communications Minister. “Now we find out that it will cost more than $600 million,” he said. 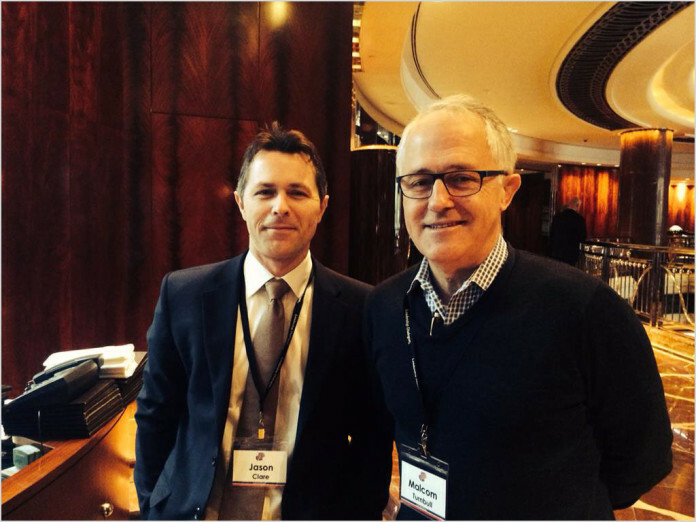 Clare said Turnbull had perpetuated a “myth” that he had somehow “fixed the NBN”. However, the Shadow Minister said, the claim was “just that — it is a myth”. Clare said when choosing the direction of the NBN following the September 2013 Election, Turnbull had relied on information that was written by “mates that he owns a yacht with”. The development of the NBN Strategic Review was overseen by J.B. Rousselot, an executive who was appointed to a senior position at the NBN company following Turnbull’s appointment as Communications Minister. Rousselot and Turnbull have previously worked together at several companies, and are reported to be joint owners of a yacht. Clare said his view on the use of Telstra’s copper network as part of the NBN had been “very clear from the start: That Fibre to the Node is second-rate”. “That it is not what people are going to need in the long term. It’s why Verizon in the United States is getting rid of copper and rolling out fibre. It’s why Singapore, Japan, South Korea, even New Zealand have decided that we need fibre to the home, not fibre to the node, relying upon last century’s copper,” he said. The news comes as Turnbull yesterday came under pressure about his stewardship of the NBN project, in the context of the fact that its infrastructure will support the National Innovation and Science Agenda the Prime Minister unveiled yesterday morning. At the launch of the innovation policy, Turnbull was forced to answer questions about the Coalition’s version of the NBN. In return, the Prime Minister strongly attacked the previous Rudd/Gillard Labor Government’s governance of the project. And last night on the ABC’s 7:30 program, Turnbull was again asked about the project. In response, the Prime Minister appeared to make a statement on the program which may have been factually inaccurate regarding the National Broadband Network, claiming that the cost of remediating Telstra’s copper network was not ten times the amount originally estimated, despite the leaked NBN documents released last week constituting evidence to the contrary. and this is the type of cronyism that screams corruption, Ergas is another example of TurnBull hiring mates who would deliver what they knew he wanted! We need a Royal Commision into the Liberal party and TurnBull’s deliberate destruction of the NBN! who also claimed he was an independent arbiter WRT the SR and yet was handing out liberal how-to-vote cards…. its hard to see anyone who doesnt fit the definition of ‘Crony’ in the appointments this government has made. if not more correctly ‘corporate cronies’. no matter your politics, that should be offensive to anyone looking on. It will eclipse the fibre rollout and they will have to call it quits at some stage. Criminals. No wonder why governments privatize everything, they just have no idea what they are doing!! The libs should just scrap the nbn! it just makes us look like a country with no real direction. That was their plan all along. Christian, correction: the libs have no direction….. Other than look out for their mates vested interests. It’s the nature of being a conservative, they fight the future, not embrace it. I agree a Royal Commission is the only way to go, if not this sort of dishonest behavior will continue indefinitely. Yes we know it was in the CP16 released August this year, so was brownfields FTTP CPP at $3,700, funny Clare didn’t mention that, I and others look forward to the release of the Labor NBN 2016 plan especially the detailed costings. What he also didn’t say is the Verizon rollout is cherry picked to certain areas only, hey Jason ask Verizon to give you a quote for the FTTP contract for Labor NBN 2016, don’t forget to tell them they have to wholesale it to their competitors at a price set by the ACCC, see if they return your call. You also didn’t mention the well established BT FTTN infrastructure and their G.fast trials in the UK or Comcast in the USA upgrading their existing well established HFC infrastructure to DOCSIS 3.1, you must have forgot in the haste to get that crucial yacht story in. Hey Jason you going to keep the Coalition NBN HFC and FTTB and retrofit FTTN with FTTP or not? hmm bit of a curly one that, best to say nothing. Well we know what the Labor NBN strategy so far is, avoid mentioning at all cost what we are going to do post election win 2016, and avoid mentioning what happened when we had NBN control for six years. I assume months out from the election a one line policy will be released, ‘Labor is the party of fibre’, the T-shirt order will be already in. Pretty sure he has already said previously that Labor wouldn’t be going back to full FTTP because it can’t at this point, but they are committed to putting fibre as close to the premises as is feasible. Likely with something like FTTdp in place of FTTN. Which, a lot of people here you like to call “fibre zealots” would support at this point from either party, since it gives people who want to pay for it, an affordable price to pay for fibre-on-demand, as the final loop is significantly shorter, and it also lets them use your often touted G.Fast as a solution for high speed access regardless. Your argument is a non sequitur, Alain. Labor’s future position on the NBN is not required to judge the LNP’s handling of it. Given that the LNP have gone out of their way to make it impossible for Labor to change anything without incurring tremendous penalties it’s not like they have any good options here anyway. But it doesn’t matter if Labor decide to replace the copper with kittens – the LNP’s performance must be judged on its own merits. Exactly, and the Liberals spent long enough complaining and criticising Labor’s plan from 2007 onwards without having their own policy, but apparently, that is fine because it is the LNP. The only hope for the NBN in the future is that a Royal Commission decides the existing contracts are illegal. And even that decision would take years to arrive. Yeah, there is no hope that an RC would fix the NBN. I agree with Jason Claire that the bit the LNP is building is pretty well a lost cause now. Where an RC would be useful, however, is in detailing how the LNP got to that point, and showing how future governments can avoid the same mistakes Malcolm has made. Funny that you mention g.fast. Would you care to explain the upgrade process from VDSL2 on FTTN to g.fast? Oh and BT have threatened if they get separated they will can the upgrades. Reality likes to mention G.Fast and then ignore the fact it can’t be used with FTTN. Just like all his other arguments which rely on conflating unrelated items to manufacture strawmen and divert attention from the failed flawed policies of his beloved liberal party. G.Fast is a upgrade path from FTTN, it is not the sole justification for rolling out FTTN in the first place. The justification for rolling out FTTN in Australia is that Telstra were paid $11b which the Coalition got the copper and HFC included, Labor were paying the same money not to have the copper and HFC and overbuild them with the most expensive infrastructure option with the highest CPP, brownfields FTTP. FTTP is the product that one of the USA’s largets telco’s AT&T stated was ‘extraordinarily costly’ and requires their own Direct TV product to help justify and pay for its rollout. Thank you Derek O for that AT&T link, most informative. G.Fast is NOT an upgrade path for FTTN unles the node is in front of your house! When are you going to stop LibTrolling your BS here? Wrong. Read the PDF application more carefully next time. As Derek said above, G.Fast isn’t an upgrade path for FTTN, G.Fast is used with FTTdp. You then have to run more fibre from the Node to the Distribution Point where the G.Fast hardware is located. That isn’t an upgrade for FTTN, it is bypassing the node. A) they cannot be run concurrently on the same network, you have to switch the whole thing from one to another in stages wherever you have copper or you’ll kill everything. B) you will have to remove some 26,000 nodes, run additional fibre out to the new FTTdp nodes and run additional power to every one of them. That’s starting to sound an awful lot more like a replacement than an upgrade. Exactly right R0, g.Fast is only good for FTTdp or MDU’s. Any upgrade from FTTN will involve throwing away tens of thousands of nodes and their equipment as it’s redundant and useless. @UG, B ) is what I meant by saying it is bypassing the node, they can in theory take the fibre bundle from the node and splice it into another fibre bundle running to the distribution point, but then they have a node that is literally doing nothing. Well duh yeah that’s a given, so are they going to retrofit active FTTN areas or not, it uses that nasty ‘last century copper’, it would be a top priority surely? They haven’t committed to anything yet, not even a hint, especially about HFC and FTTB. I bet they don’t want to to be seen as anything like a ‘nearly same as Coalition policy’, they will just hint at it being different keep it vague and keep head kicking Coalition policy based on yachts and that nasty ‘last century copper’, and hope that gets them over the line. “Well duh yeah that’s a given”..
Well duh, that’s because with MTM in complete and utter disarray, not even the current NBN or government know from day to day just how much copper/HFC is usable… let alone those in the wilderness of opposition. Just more proof of the shamefulness of this government not just sticking with FttP, that even you yourself, only a couple of days back, admitted was/is a vastly superior roll out to FttN/MTM. Remember now… when you also admitted the abysmal MTM failure is the current NBN/Gov’s (Morrow/Turnbull) fault because Conroy/Quigley’s are no longer in charge…? Reality, I am sick of you ignoring reality. “Fibre to the node will be gone, it’s not a question of if this will happen, it’s when it will happen and how it will be done. That reads they will be putting fibre closer to the premises, Renai even did an article about it…. Jason Clare in the past two days made a statement referencing FTTdp that nbn is currently doing trials with, with a claim that at some point before the election, nbn will switch tack and start rolling out FTTdp instead of FTTN. Now, that could just be crystal ball gazing, but it also suggests to me that Labor is looking at FTTdp as a solution to dealing with the MTM if they are returned to power. Yes, they haven’t released their entire policy yet, but really, who cares? When did the LNP release their $29bn 25Mbit for all by 2016 before the election? April 2013? Oh, right… What’s good for the goose isn’t good for the gander in your ridiculous world. You expect Labor should release their policy now, and if they don’t, they don’t get to complain about anything. Funny how the LNP did a whole lot of complaining about the NBN without ever discussing what their plans were until 5 months before the election. It’s ok mate, Malcolm will probably pay for another SR soon that’ll show FTTN down to $200/install and FTTP actually being $10k/install. I thought it was $20k? Isn’t the the figure they were using for last mile fibre termination costs?